The Fourth of July is a wonderful day to make homemade ice cream, and the 100 degree temps will sweeten the efforts! Our favorite family recipe comes from Rachel Mastez's The Ice Dream Cookbook. Scroll down on Rachel's page, here, for the original recipe to make this delicious treat. What I love about this dessert is the simplicity in creation. Gelatin, honey, stevia, salt, coconut milk, and vanilla are all you need and the preparation couldn't be easier. You start by dissolving the gelatin in water, and then mixing everything in the blender. If you let this mixture cool for 6 hours in the fridge, it takes on a delightful thick custard texture, but if you add it to an ice cream maker with salt and ice, you'll have a creamy dessert ready in 30 minutes. An added benefit is that you don't need a fancy machine. 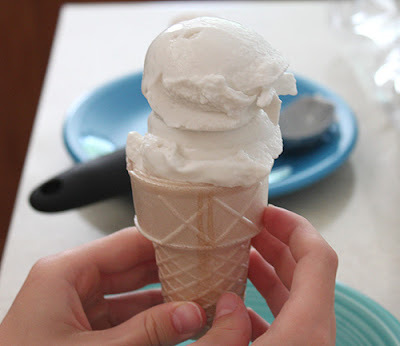 We use a simple inexpensive ice cream maker from our local grocery store, and it has worked for many years without trouble. While the vanilla is wonderful, the chocolate is my favorite. Rachel shares other fun variations on her blog, such as pumpkin, strawberry, and lemon. Vanilla Ice Dream by Rachel Mastez, from the book, The Ice Dream Cookbook. Purchase online from Rachel's site, here. 1. Add 1/3 cup water to a small saucepan. Slowly sprinkle with gelatin or agar agar powder. Let stand for 2 minutes until it softens and dry spots disappear. Warm over medium-low heat, without stirring, until gelatin or agar agar dissolves. Scrape the mixture into a blender, Vita-Mix, or food processor. Cover and process until smooth. 2. Add honey, stevia, and sea salt. Blend. Add the coconut milk and vanilla, and blend until smooth, stopping to scrape the sides with a spatula. For a sweeter taste, add an additional 1/8 teaspoon stevia and/or 1 tablespoon honey or agave nectar. Blend, taste, and repeat if needed. 3. Pour into one or more wide mouth jars. Cover and refrigerate for at least 6 hours before churning or chill more quickly with an ice bath. 4. Scrape the chilled custard into the canister of your ice cream maker and churn according to the manufacturer’s instructions. 5. Serve immediately or spoon into several 8- to 16-ounce freezer-safe containers. Cover and freeze for 3 or more hours for a firmer texture. Pictured with a gluten free ice cream cone.